This morning, the U.S. Supreme Court punted on two major gerrymandering cases, sending gerrymandering cases from Wisconsin and Maryland back to the lower courts. One rigged the lines against Democrats, the other against Republicans. The Court had the chance do what’s right for America: To rule that gerrymandering is unconstitutional. But they failed to do so. It’s a disappointment, but it proves yet again that in America, change comes from people in cities and states taking matters into their own hands. Represent.Us members are doubling down on campaigns to stop gerrymandering state by state. Represent.Us demonstrators gather outside SCOTUS during oral arguments in Gill v. Whitford in October. You should really see this: https://act.represent.us/sign/SCOTUS-Gerrymandering-GillvWhitford?source=taf . RepresentUs has a smart plan to fix our broken political system. Check it out. Gerrymandering is a form of corruption: It's an abuse of power by politicians, and it rigs the system against voters. It undermines the integrity of our elections and our constitutional right to representation. Today’s Supreme Court decision makes it clear that it is up to the American people to fix this problem. And we are: Ohio voters passed nonpartisan gerrymandering reform by a record margin in May, and voters in four more states will weigh in on gerrymandering this November. There are more campaigns then we've seen since Watergate, and the stakes for those campaigns are even higher with today’s decision. So What Did the Court Say? In its decision today in Gill, a unanimous Court held that the plaintiffs challenging a gerrymandered map in Wisconsin had failed to prove that they'd suffered the sort of direct, personal injury that is needed to give them standing to sue. Because the plaintiffs didn't prove they had standing to bring their case, the Court didn't reach a ruling on the merits of the case. Instead, it sent their case back down to the lower court, where the challengers will have another chance to show how the gerrymandered maps harmed them. Basically, the challengers will now need to show that their individual state legislative districts were drawn to dilute their votes. If they're able to show this direct, personal injury, the case could come back before the Supreme Court, and we could see a final, substantive ruling on partisan gerrymandering next year. Why Did the Court Send This Case Back? Article III of the Constitution only allows federal courts to hear an actual "case or controversy." Before a federal court can hear the merits of a case, the person bringing that case must show that they themselves have suffered a direct, personal injury. Just being a voter, or a taxpayer, typically isn't enough to get into court; you've got to show a direct connection between a particular law or practice and harm done to you. In Gill, the plaintiffs were twelve Wisconsin voters who were self-proclaimed supporters of the Democratic Party and Democratic candidates. They claimed that Wisconsin Republicans had diminished the power of their votes by drawing gerrymandered districts that "cracked" and "packed" Democratic voters across. The challengers argued that the gerrymandered maps hurt their ability to elect more Democrats across the state. All nine justices agreed that none of the plaintiffs had proven that the gerrymandered maps resulted in concrete, particularized injuries to the voters, or had burdened their individual votes. Instead, according to Chief Justice John Roberts, the voters' lawsuit was based on a "theory of statewide injury to Wisconsin Democrats." This theory was too indirect—too disconnected to the individual voters—to satisfy Article III standing. Per Chief Justice Roberts' opinion, "This Court is not responsible for vindicating generalized partisan preferences. The Court's constitutionally prescribed role is to vindicate the individual rights of the people appearing before it." Some hope lies in a separate concurring opinion from Justice Elena Kagan, which was joined by the other three liberal justices. Justice Kagan laid out a roadmap for how the challengers could prove personalized injuries to the lower court going forward, adding that: “ "[O]nly the courts can do anything to remedy the problem [of partisan gerrymandering], because gerrymanders benefit those who control the political branches." What's Next in the Fight to Stop Gerrymandering? We're live right now with Represent.Us Political Director, Dan Krassner, and Represent.Us Senior Counsel, Scott Greytak (video starts at 1:20). They're discussing today's Supreme Court decisions on gerrymandering, what it means for the future, and how you can get involved! 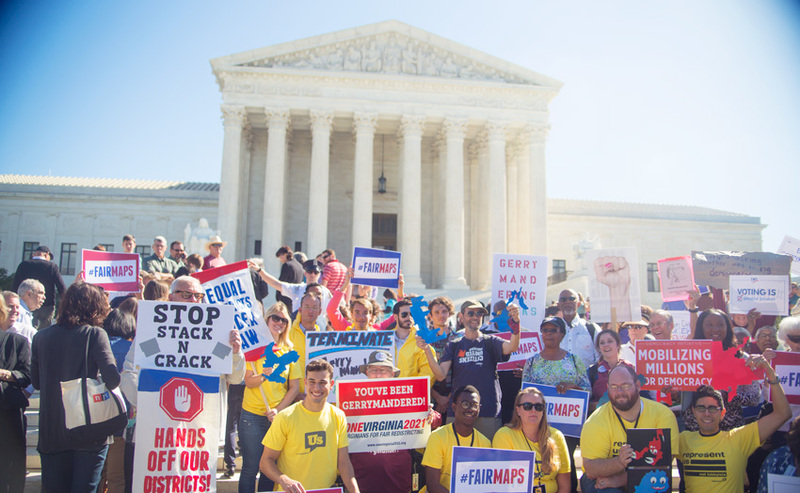 But Represent.Us is supporting campaigns across the country; not just at the Supreme Court. 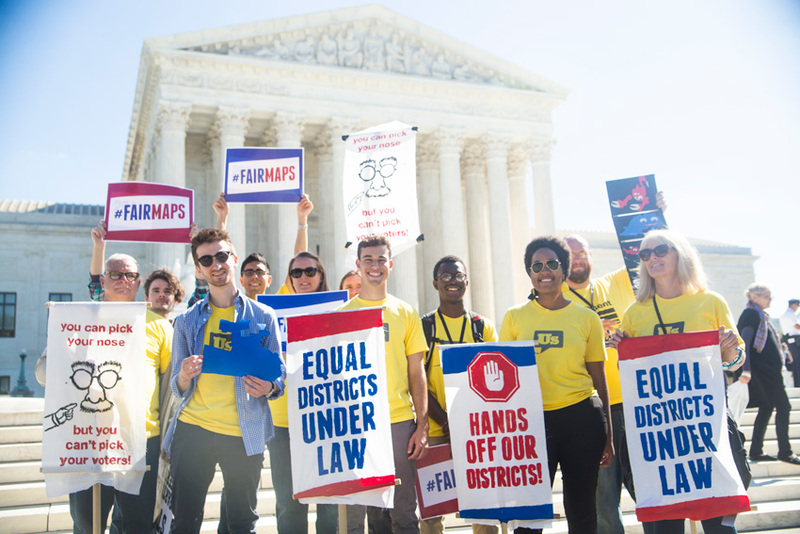 Our members supported the Ohio gerrymandering reform ballot measure win in May and now we're fighting to help partners win victories against gerrymandering in Michigan, Colorado, Missouri and Utah. There are more political reform efforts happening this year than there have been since Watergate. Nearly 100 reform campaigns can be found on this map. We know that the only path to meaningful and sustainable change on this issue is through state and local action. Because citizens signed up, donated, and collected signatures, 8 million voters in Ohio got the chance to end gerrymandering at the ballot box — and they did it. In November, millions more in Michigan, Missouri, Colorado and Utah will have their chance. With your support, we’ll sweep them all, and take this fight to many other states to fix this rigged system. Bottom line, the Court used technical requirements to punt on both cases. 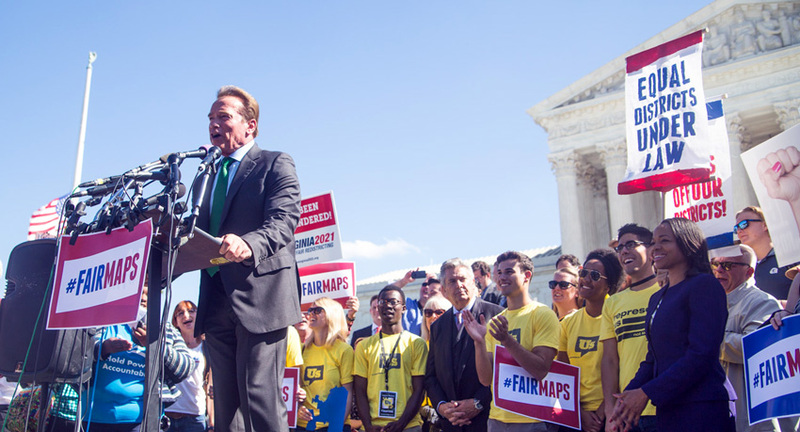 This leaves fixing the gerrymandering problem largely in the hands of voters.